I’m wearing closed-toe shoes today. Yes, it’s 90+ degrees outside, but I’m not taking any chances. You may think I’m overreacting or that I suffer from ophidiophobia, the abnormal fear of snakes. You’re probably right on both accounts. You see today, July 16, is World Snake Day. I suspect that snakes are unaware that they have a special day, but just in case one slithers across my path, my toes are covered! I have a vivid childhood memory of being chased by a snake. I was tromping around in an empty field next to my home. I saw the snake. I screamed. I ran. The snake was blue. When I stopped to see if I had outrun the snake, it stopped, raised its creepy little head, and stared right at me. You may think this sounds suspicious, but I promise it really happened—or at least that’s how I remember it! No one in my family believed me either. Ha! 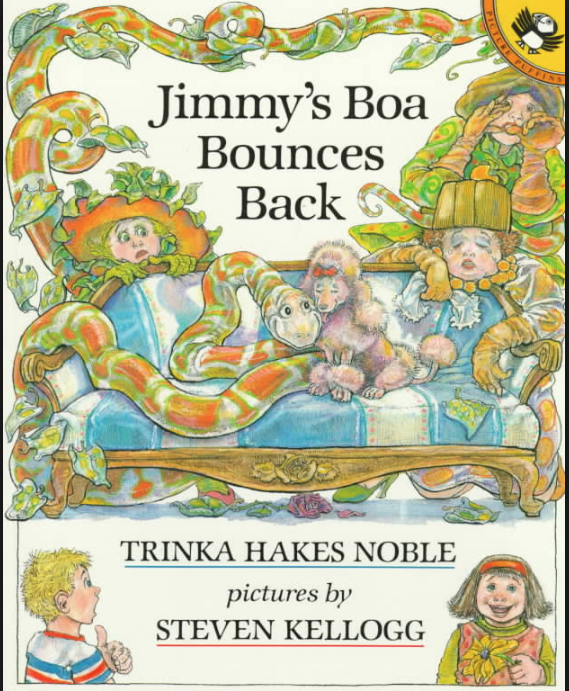 If a study of reptiles, the rainforest, or another snake habitat are in your plans for the coming school year or you plan to share the adventures of Jimmy’s Boa, check out the links below. I do realize that snakes are helpful and basically harmless. They still scare the willies out of me! How about you? For snake-themed projects like these click HERE. For follow-up worksheets to Jimmy’s Boa Ate the Wash, click HERE. I’m not really afraid of snakes,I just don’t like them at all. As long as they aren’t dangerous, I don’t mind them. Have had 3 rattlesnakes in the yard over the years. My husband almost stepped on one of them. I was near hysterics over that. But a month ago, there was a 6-ft bull snake in the yard. That was COOL! Small snakes in the lawn are fine but any snake on water is instant terror – yikes! I don’t like snakes . I had one slide across my feet wearing flip flops I screamed and about flip flopped myself! So I’d be like you wearing a pair of closed toe shoes. Not a big snake person, but thankful for their place in the food chain.